Demolition of the north sidewalk on the Boone County Courthouse square was completed last week. 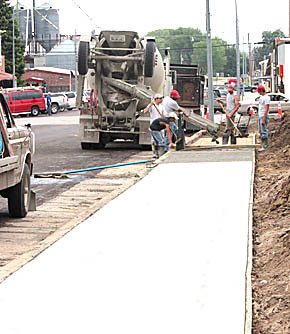 Early this week, workers from Boone County Concrete were finishing concrete for the new north sidewalk. Soil will be hauled in to slope the grounds to the sidewalk next to the curb. The same process will occur with the east sidewalk. Both the retaining wall and existing sidewalk will be removed and the ground resloped.